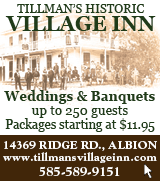 Our classified ads appear in the Lake Country Pennysaver, too! Rates begin at just $10. 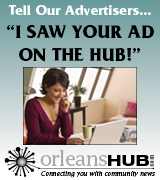 To place an ad, contact us at classifieds@orleanshub.com, or call us at 585-589-5641. Lost & Found entries are free of charge and will run for two weeks. Please keep your entry under 15 words. To place a Lost & Found entry, contact classifieds@lakecountrymedia.com, or call us at 585-589-5641. All items have found their way to their owners. Thank you! 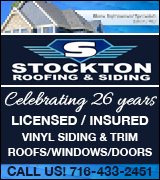 Custom trim, replacement windows, vinyl siding, metal, shingle and rubber roofs, patio decks, seamless gutters. Free estimate, fully insured. 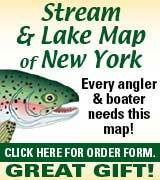 Call 585.735.3441. 2019 Albion Strawberry Festival Turtle Race: Saturday, June 8 @ 2pm. Along canal between Main St. & Ingersoll St. bridges. 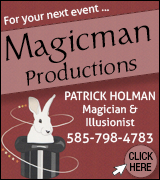 Tickets: $5.00 each or 5/$20.00. Prizes totaling $1,000.00. Tickets can be purchased at: Medina Hospital or any Rotary member. KEN HEITZENRATER HOME IMPROVEMENTS: Roofing, siding, replacement windows, decks, garages, additions. 716.795.3705. 6¢ per container. Murray Superette Redemption Center, 16573 Ridge Rd., Holley. Open Thurs., Fri. & Sat., 10am till 5pm. Rt. 104, Medina 585.798.3784. GENERAL CARPENTRY/ Remodeling: Bathrooms, kitchens, tile work. Doors, windows, siding, gutters, plumbing/electric. www.royaltonremodeling.com. Does not service Holley area. 716.491.8733. Residential/Commercial. Fully Insured. Free Estimates. 585.590.9881. Houseman’s Landscaping, Inc.
Tractor tires, rims, tubes & parts. Ridge Farm Supply, Rt. 104, Jeddo, 585.735.7429, www.ridgefarmsupply.com. Think Spring and have your bike tuned up. Bicycle Sales and Service. Martin’s Bike Shop, 11942 Alps Road, Lyndonville. CUSTOM-MADE RUBBER STAMPS – and self-inking stamps – return address or what ever you might want on a rubber stamp. Any stamp can be customized with a logo, initial or design. 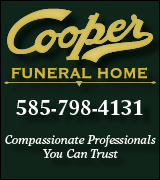 Stop in and see what we have to offer – Lake Country Pennysaver 170 N. Main St., Albion 585.589.5641. The Tree Service. For all your trimming and removal needs. Yard & fallen tree cleanups. Fully insured. 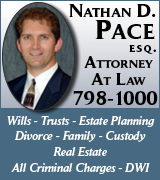 Serving Orleans County and the surrounding counties. 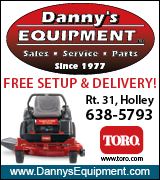 For free estimates, Call Tom 585.353.6927. MJP GENERAL CONTRACTING: Commercial & residential. 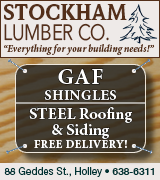 Roofing, siding, windows, doors, decks, additions, garages, pole barns. Fully insured. Free estimates. 716.955.9244, mjpgeneralcontracting.net. ORLEANS BLUEBIRD SOCIETY MEETING: April 24th, 7pm. Pullman Universalist Church, Albion. Residential & Commercial. Insured, free estimates. L & M Roofing 585.303.5953. Free estimates. 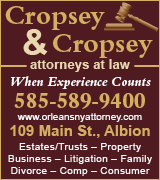 Serving Orleans County & the surrounding counties. For more info Call Tom 585.353.6927. LETTERHEAD, ENVELOPES, BROCHURES – WE PRINT EVERYTHING! 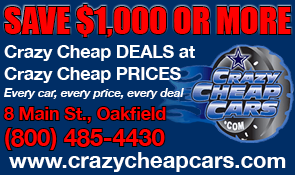 Check our low prices! Lake Country Pennysaver, 170 N. Main Street, Albion 585.589.5641. From Asics, Saucony, New Balance. Medium & wide. $10-$20 off. Sneaker Barn, Rt. 104, Medina 585.798.3784. INVENTORS – FREE INFORMATION PACKAGE Have your product idea developed affordably by the Research & Development pros and presented to manufacturers. Call 1-888-501-0236 for a Free Idea Starter Guide. Submit your idea for a free consultation. Seaward Candies. Homemade chocolates for all occasions. Main St. Brockport, 585.637.4120. For All Your Handyman Needs. No job too small. We do it all. Insured/senior discounts. 585.331.6565, Bill Stephens. Peter Madafferi’s Paper Hanging & Interior Painting. Quality work at an affordable price. New Phone #585.230.6411. 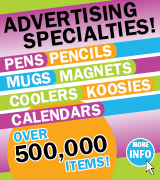 PENS, PENCILS, MUGS, KOOSIES – See us for all your advertising novelties. 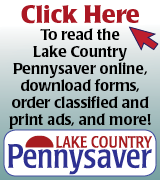 Lake Country Pennysaver 170 N. Main Street, Albion 585.589.5641. Small truck, 1- to 10-tons, also small backhoe & bulldozer work. Call Tom 585.993.1168. CARPET layer has thousands of yards of carpet leftover. Call Hugh 585.798.0909. Hedge trimming, lawn mowing, mulching, planting. FREE ESTIMATES. Fully insured. Nothing too small. 585.474.4599, hcruzlandscaping@yahoo.com. FROM OLD FRIEND. Men’s & women’s, medium & wide. $10.00 off. Sneaker Barn, Rt. 104, Medina 585.798.3784. Long Bridge Property Management is now doing lawn care. 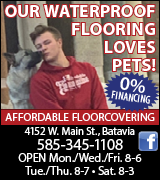 Call for a quote 585.455.1267. Lawn Rolling/ Leaf Clean up. Residential/ Commercial. Free Estimates Fully Insured. 585.590.9881. Houseman’s Landscaping, Inc.
Driveway stone, top soil & sand. Small to medium loads, tractor available to spread. 585.732.4370 or 585.765.2003. KILN-DRIED OAK cutoff firewood. Any size load. Call 716.870.8718. Delivery available. Dave’s Appliance & Furniture & more. Middleport 716.735.7053. Reconditioned appliances, new appliances & furniture. For all your landscaping needs. 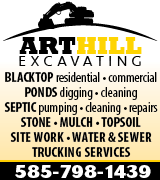 Mulch, topsoil, rock, stone, walkways, general landscaping. FREE ESTIMATES. Call Tom 585.353.6927. Orleans County CCE presents Master Food Preserver Training. April 30-May 2. Three-day, hands-on training in many methods of food preservation! $300 includes all supplies, manual, products to take home and lunch each day. Course held at 4-H Fairgrounds Trolley Kitchen. 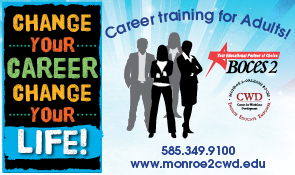 Call 585.798.4265 to register. Planting Maintenance/ Bulk Mulch. Planting Design/ Hedge Trimming. Fully Insured/ Free Estimates. 585.590.9881. Houseman’s Landscaping, Inc. Tired of mowing? Let us mow your yard. FREE ESTIMATES. Ron 585.415.5941, 585.851.6936. Senior discounts. Call the best and forget the rest. Affordable German quality. 585.354.2339. WANTED TO BUY: Good working refrigerators & stoves. 585.589.4270. Order your award-winning homemade pie today. 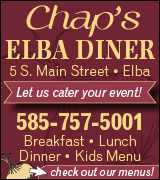 Chap’s Elba Diner, Main St., Elba. 585.757.5001. Let us clean your hedge row. Excavator bush hog. Call 585.797.7546, for quote. Quality, clean excavation water line installation from home to road. FREE estimates. Chappius Excavating 585.797.7520. Storage trailers for sale or rent. 585.416.5029. MISS RONNIE’S LITTLE RASCALS. NYS Licensed Daycare. Has openings for ages 12 & under. 585.589.7172. Having retired from business, owner will sell refrigerant stock. Must be licensed to purchase. Call for further info. Terry Edwards 585.455.1593. Spring cleanup, mulch, top soil, seeding. Lawn mowing, string trimming, hedge and shrub trimming. Free estimates. Senior discounts. Call 585.331.7957. When you need a pastor to preach, Rev. Larry Eastlack of Medina’s Grove United Methodist Church is available for Sunday services that begin 10:30 am or later. Call 585.698.4658. Nicely cushioned walking or running. Medium to X-wide. Take $10 off. Sneaker Barn, Rt. 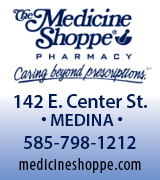 104, Medina 585.798.3784. Demonstrate your skills & crafts in our ACE-sponsored demonstration tent. Call June at 585.704.1994. 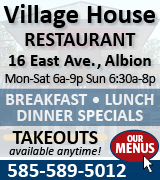 Albion Strawberry Festival, June 7-8. Tractor Starters, Generators, Carburetors, Magnetos, Hydraulic Cylinders & Pumps -Rebuilt & Repaired. Ridge Farm Supply, Rt. 104, Jeddo, 585.735.7429. www.ridgefarmsupply.com. Need Raffle Tickets? Come to the Lake Country Pennysaver, 170 N. Main Street, Albion, 585.589.5641. Holley: Applications available at Village Clerk Office 72 Public Square. 4’x8’ raised beds, organic. $20.00. Applications due April 26th, Garden open May 11th. Call Susan Persia 585.638.5750. AND REMODELING. 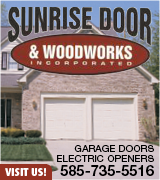 Windows, doors, remodeling upgrades. 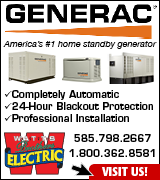 24-hr emergency service. Fully insured. Call Larry @ 585.957.3200. Glass, insulated glass, screen and mirror repair. Case’s, 413 Proctor Rd., Medina. 585.798.3540. CLIP JOINT, MEDINA. Open Wed., Thurs., Fri. 9-6, Sat. 9-3. 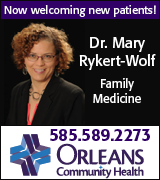 Closed Sun., Mon., Tues. Walk-Ins welcome! 125 East Center Street. 585.798.4922. Firewood For Sale: Murray Superette, 585.638.5736. For Sale: 2 solid wood bunk beds. Please call 585.402.6578. WANTED: STANDING HAY in Middleport, Gasport, Medina area. Phone 585.735.6206. Crosley & Speed Queen. Ranges, Refrigerators, Freezers, Washers & Dryers. FRENCHY’S APPLIANCE, Ridge Rd., Albion. 585.589.5947. ATTENTION: HUMAN SERVICE AGENCIES. 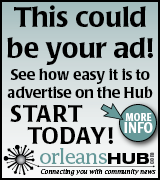 Orleans County is receiving EMERGENCY FOOD and SHELTER FUNDS. Any Agency interested for funding please call Michelle Figueroa at 585.589.5605 ext.105. Bed covers, bed mats, step bars and other accessories. We can order in anything if not in stock. Truck Options Plus, 3871 Rt. 98, Albion, 585.589.1153, M-F 8-4. Sat 9-12. Petals & Lace Florist. Adorable Easter gifts. Flowers, plants, candy. Open Monday-Saturday. 2120 Eagle Harbor Waterport Rd., Waterport. 585.682.3378. GUITAR & KEYBOARD SALE. Roxy’s Music Store, 228 West Main St., Batavia. 585.343.7222. SERVICE ALL BRANDS. Installation, parts. Chimney relining, repair, caps & dampers. 42-ft. lift service. clarencefireplace.com. Call/text/Email 585.356.5567, dhw202@yahoo.com. 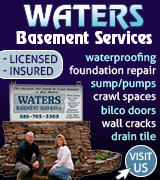 See us at the Orleans County Home Show! FOR SALE: ROUND OAK TABLE cut down to coffee table. “Must See”. Call to see text picture. $300. 585.682.4292. (Waterport). 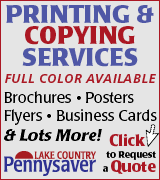 BLACK & WHITE COPIES – Lake Country Pennysaver 170 N. Main Street, Albion 585.589.5641. ENERGY SAVING NEW WINDOWS! Beautify your home! Save on monthly energy bills with NEW WINDOWS from 1800Remodel! Up to 18 months no interest. Restrictions apply 855-338-5767. VENDORS WANTED: Indoor/Outdoor Yard Sale. Sat., 5/11. Medina United Methodist Church. Call 585.798.3131 or apply at church office. Rooms for rent, very clean, all utilities included in Albion area. 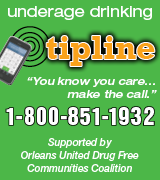 Please call 585.589.4270. MAIN STREET, ALBION. Over 4200-sq.-ft., office space or storefront. Can be divided. Call 585.356.9656 or 585.589.7491 leave message. MEDINA: Large 1-bedroom. Appliances included. No pets/smoking. 1st, last & security required. Available 5/1. Showing begins 4/20. $575 plus utilities. 585.615.8891. FOR SALE: 1991, 14’x80’ Mobile Home. 2-bedroom, 2-bath. Completely gutted. All new inside: carpet, appliances, bath fixtures & paint. $15,000 cash. Call 585.798.0201. BY OWNER. Village of Medina. 3-bedroom, 1st-floor laundry. Appliances included. 16 x 16 deck and 2 story barn. $57,000. 585.798.0357. 1-, 2-, and 3-bedroom apartments in Albion area available. Newly remodeled, energy efficient. Please call 585.589.4270 for more information. MEDINA: Spotless, remodeled 1-bedroom apt. Appliances, laundry, blinds & balcony. No pets or smoking. 585.735.3071. For Rent in Medina: Large 1-bedroom upper. Off-street parking. Washer & dryer included. Non-smoking. No pets. Not Section 8 approved. $510 plus security, plus utilities. Available May 1. 585.356.4576. 2-bedroom apartment in Medina, quiet neighborhood. Includes stove & refrigerator, storage shed. Laundry hookup. Ample parking. Private back yard. No smoking. No pets. 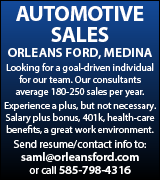 References & verifiable income required. Call 239.772.5310. For Rent: 2- & 3-bedroom apartments available. Albion & Medina. No pets. 585.589.7478. Habitaciones en alquiler en area de Albion, por favor llame al 585.589.4270. FOR SALE: 1989, 14’x76’ Mobile Home. 3-bedroom, 2-bath. Completely gutted. All new inside: carpet, appliances, bath fixtures & paint. Central air. $25,000 cash. Call 585.798.0201.